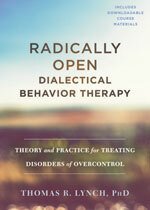 RO DBT has changed my life dramatically. I am no longer depressed and have the ability of choice in my life (flexible mind). Before RO DBT I was very fixed and was in a deep depression, unable to make the changes I so desperately needed. Superb presentation, excellent materials. The result is the pulling together of the science and practice of psychology almost never seen anywhere!